Follow the latest developments and announcements at Callbox, and find out what the callbox team is up to—straight from the source. The free event brings two of Callbox’s top sales experts for in-depth, hands-on lessons on building and improving a modern ICT sales prospecting process. Callbox will be hosting a free workshop titled “Sales Prospecting Masterclass for Information and Communications Technology (ICT)” on March 29, 2019 at Found8 @ 79 Anson Road. The live event aims to equip ICT marketing and sales decision makers with the knowledge and tools to get better results from their prospecting efforts. 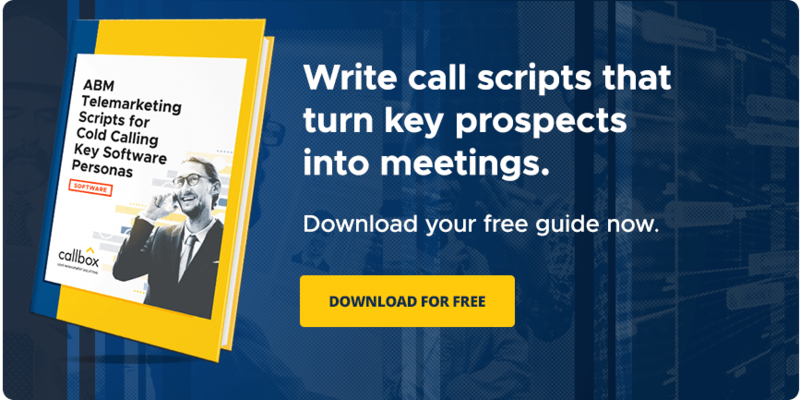 The Callbox team has put together this masterclass to meet a clear need from ICT sellers to develop a complete, coherent, and consistent prospecting program that works in today’s ICT buying landscape. The way that ICT customers find, evaluate, and purchase solutions continues to change. Along with this shift, vendors need to transform their marketing and sales processes to adapt to these developments. But, as the huge gap in prospect conversion rates between top-performing and average reps shows (52% vs 19%), it’s clear that there’s still ample room for improvement in most companies’ prospecting processes today. The data preview tool can now be accessed at https://www.callboxinc.com/data-list-by-country/ and is open to all site visitors. Try out our Data List Preview Tool now! &THEN is the Direct Marketing Association’s largest annual conference. It highlights the people, companies, and developments shaping data-driven marketing today. For two days at the Ernest N. Morial Convention Center, &THEN will feature hundreds of educational sessions and hands-on workshops on the “data-first” approach in marketing. The &THEN 2017 page touts this year’s roster of speakers as an “unprecedented lineup”, and we couldn’t agree more. The event participants include marketing and brand leaders from IBM, Deloitte Digital, FedEx Services, Nordstrom, Adobe, Hershey’s, 1-800-Flowers, Verizon, and more. We’ve been covering many of these areas on Callbox’s Savvy Marketer Blog for quite a while now, so we’re really aching to gain some fresh expert perspective on these topics. Of course, an event like &THEN wouldn’t be complete without the chance to rub elbows with industry experts and fellow marketers all over the world. So, if you’re heading to the 2017 &THEN Conference next week, too, we’d love to meet you there. Callbox: We’re Off to the Sales 3.0 Conference, Las Vegas! The Callbox team is heading to the Sales 3.0 Conference, Las Vegas, the second leg of a three-part series of high-profile conventions aimed at sharing insights on Sales 3.0 technologies and methods. The event features an impressive lineup of speakers that include sales managers, directors, and VPs from SAP Hybris, Strategic Pricing Associates, IBM, EcSell Institute, Revenue Storm, Oracle, SalesBuzz, Carew International, among others. The Las Vegas convention comes hot on the heels of the successful Sales 3.0 Conference, San Francisco which took place back in May, and builds on the Sales 3.0 series’ focus on the role of AI and predictive analytics in shaping today’s sales processes and operations. These topics are becoming increasingly relevant to today’s sales workflow since organizations are starting to reap the benefits of using tools like machine learning and AI. For example, more sales teams are now using AI-enabled lead scoring to help them predict which opportunities will close. That’s why the Callbox team is excited to be at the Sales 3.0 Conference, Las Vegas. Callbox has always embraced and leveraged technology to maximize marketing and sales results for our customers–from the SMART predictive dialing engine that powers our call handling systems, all the way to the Lead Nurture Tool that places marketing automation at our client’s fingertips. If you’re attending the Sales 3.0 Conference, Las Vegas, We’d love to chat with you there. Click the banner below and let’s meet up. Join the Callbox Team on Sales 3.0 Conference 2017. We can’t wait to meet and connect with you. Schedule our meet up, click the banner below! https://i1.wp.com/www.callboxinc.com/wp-content/uploads/2017/09/01-BLOG.jpg?fit=800%2C352&ssl=1 352 800 Rebecca Matias https://www.callboxinc.com/assets/callbox-logo.svg Rebecca Matias2017-09-08 08:48:122019-01-02 07:11:56Callbox: We're Off to the Sales 3.0 Conference, Las Vegas! What are the things Boston is known for? Well, there’s the Red Sox and Mark Wahlberg to boast about, and not to mention the exquisite New England cuisine that has become a tourist attraction in itself. But there’s is something more to Boston than meets the eye. Being one of the most progressive cities in the United States, Boston is home to some of the countries exemplary educational institutions such as Harvard and the Massachusetts Institute of Technology. In fact, much of Silicon Valley’s pioneers had their early start in the sacred halls of these schools. Because of the intellectual atmosphere, it embraces, Boston rightly passes as an excellent location where knowledge-sharing and influence go hand-in-hand. And because of that, it has been picked as the venue for this year’s Inside Sales Conference on September 7 at the Sheraton Norwood Conference Center. Speakers for this year’s event include big names such as AA-ISP Chairman Bob Perkins, best-selling author and Sales for Life CEO Jamie Shanks, Videolicious CEO Matt Singer, and Infinity President Jay Davey. This one-day event comprises of a series of discussions and workshops aimed at increasing the marketing and sales performance of participating brands. To give you a glimpse of what this year’s conference offers, there will be a talk on building a robust sales team using analytics, a workshop on how to generate more appointments and close more deals, and essential ideas on how to use emails and personalized video to establish stronger audience connections. B2B companies wouldn’t want to miss a chance hearing about these important topics and more, which is why Callbox is proud to announce it is joining the Inside Sales Conference this year. Aside from rubbing elbows with industry leaders and sharing what it already knows in the world of B2B marketing, Callbox will also be there to strengthen its already exemplary skills in bringing effective lead generation to the table. The company has already joined various industry events and has already made rounds in establishing professional networks with other industry leaders. It goes to show that Callbox is incessant in showing its desire to learn as much as it can about its own industry. The company has already joined various industry events like Interop ITX, Dreamforce, and &Then and has already made rounds in establishing professional networks with other industry leaders. It goes to show that Callbox is incessant in showing its desire to learn as much as it can about its own industry. We will be sending our delegation. If you’re going there too, then what a coincidence! Let’s meet up and make the Boston experience a memorable one. Join the Callbox Team on Inside sales Team 2017. A lead generation agency’s entire raison D’être is to help you get in front of your target prospects–whether through email, phone, or face-to-face. But regardless of how a lead generation company delivers opportunities, it all boils down to providing you with actionable marketing and sales insights. That’s what separates the best lead generation companies from the rest of the pack. Get to know Callbox even better. Watch our About us video! https://i2.wp.com/www.callboxinc.com/wp-content/uploads/2017/06/01-blg-best-sales-lead-gen-2016.jpg?fit=800%2C352&ssl=1 352 800 Rebecca Matias https://www.callboxinc.com/assets/callbox-logo.svg Rebecca Matias2017-06-09 05:10:042019-04-17 22:36:56Callbox Gets a Nod from Comparakeet!